Today I was able to check one of the items off my DC bucket visit list that had been there for a long time - the Udvar-Hazy Center - Smithsonian Air and Space near Dulles Airport. I have long wanted to visit but it can get a little crazy getting out there and you almost have to commit to a whole day - depending on where you are in the city. Since I am staying down at the Mount Vernon estate it was a full day commitment. I got up early and started my day on a bus that left mount Vernon at 7:30 AM. The bus took me up to the Huntington Metro stop where I took the yellow line, switched to the silver line which took me as far north as I could go, then jumped on another bus which took me the museum. I knew where I as going and had a very minimal wait time before the bus and I made it to the museum at 10:30 AM. I have to admit, toward the end of my three hour commute I was wondering in the back of mind if it would all be worth it. That being said, the answer is a resounding YES. It also took me 3 hours to get back to Mount Vernon, a total of 6 hours on public transit today. When I first arrived I found a small locker to store my backpack while taking in the museum. You definitely couldn't fit a larger carry on - I did see some people rolling them around while touring the museum - but plenty of room for a couple of backpacks. The lockers took one quarter but you got it back so essentially it was free storage. I wanted to see an IMAX movie about planes so I bought my ticket in advance and while purchasing the ticket also bought a Smithsonian membership. It was $12 but gave me a discount on the movie ticket as well as 10% off at the onsite McDonald's and gift shop. You also get a subscription to the Smithsonian magazine. I think it almost paid for itself by the end of the day. 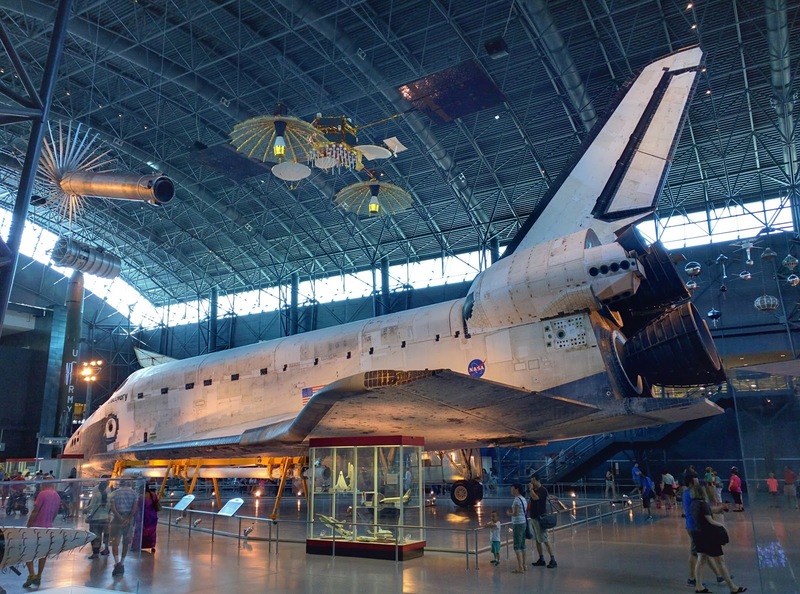 I love the air and space museum on the mall but I really enjoyed the open areas to walk around the large planes and really appreciate the size and presence of these amazing machines. You are able to see them at ground level on the floor or via ramps that allow you to get up and see many of the planes from above, in some place four stories high. The crown jewel for me is the Space Shuttle Discovery. I grew up as a child of the 80's and I loved reading about and watching the shuttle. Seeing it in person is a thrill and was probably my favorite part of the day. I'm sad we still don't have a shuttle in service. A close second was seeing the Enola Gay - made in Nebraska by the way. It is a beautiful bird in it's own right and I have always thought the B-29 Superfortress was the coolest of all WWII planes. 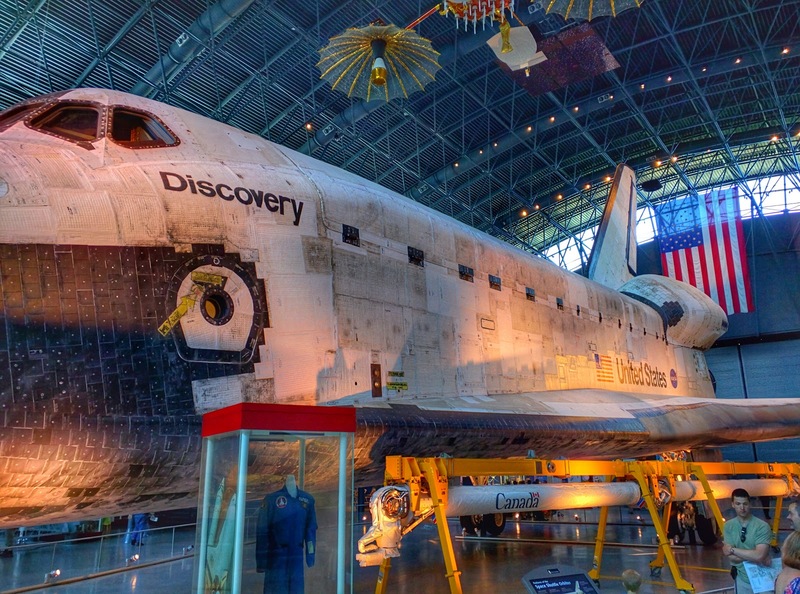 I saw it, or part of it, years ago at the mall site but it is so much better seeing it as an entire plane. I remember there was controversy at one point in the 90's about if the Enola Gay should be on display since it dropped the first atomic bomb. I don't think there is any doubt it should be on display. When I see it I think of the potential hundreds of thousands of American lives it saved when an invasion of mainland Japan was not necessary as a result of Japan's surrender. I was excited to see an exhibit in which you could sit in a seat and essentially fly the 1908 Wright Flyer using a simulator. I waited in line about 15 minutes for the free turn at the controls. The computer simulation you were seeing on the screen was Fort Myer here in DC. 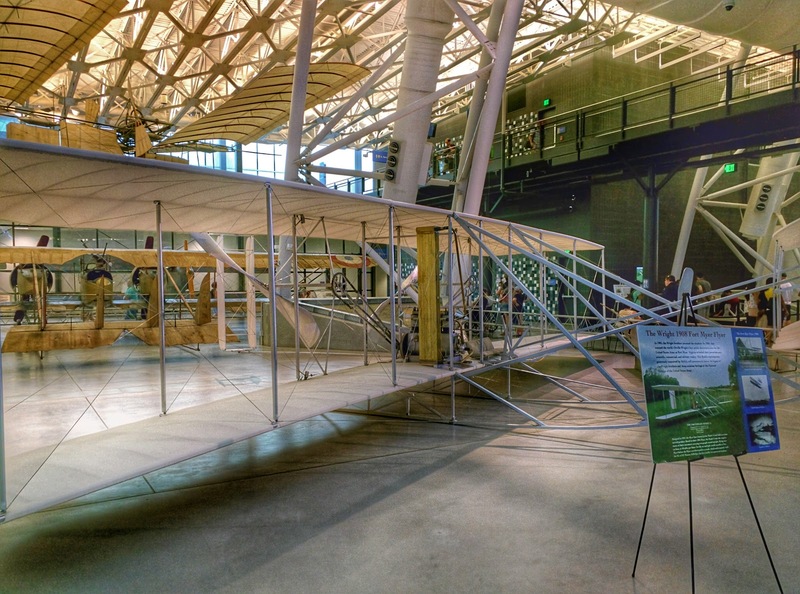 As I was recently reading David McCullough's "The Wright Brothers" I tried to imagine in my mind what it would be like to fly the flyer so this was awesome. My flight lasted about two minutes. I glided a little too long at one point when I should have been adding altitude and crashed. It was really fun though and I asked the gentleman helping with the exhibit to take my picture. I stopped at the gift shop before leaving and bought two items - a great guide of the museum with color photos and descriptions of all items in the museum and a copy of the new book - "The Ordinary Spaceman" by Clayton C. Anderson. Clayton Anderson is a hero back in Nebraska as a small town kid from Ashland, Nebraska who became an astronaut with 167 days in space. I had thought about buying it when it first came out and considering that it was an autographed copy and I had a great day seeing the shuttle it was a must get. 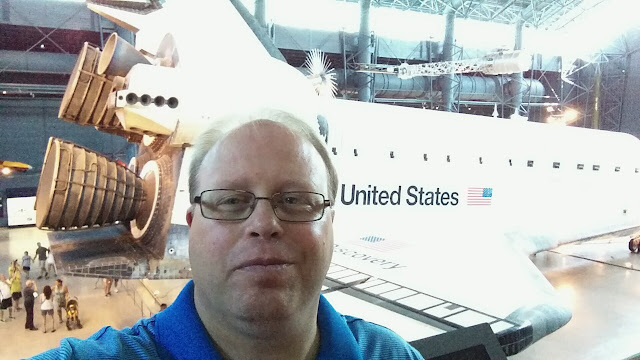 Overall it was a great day and I'm glad that I spend the six hours on public transit - during part of which I wrote this blog entry - to see the Udvar-Hazy Center. Tomorrow it is back to working on my finishing up my archaeology at Mount Vernon lesson plan.